Cumbria Beekeepers Association is a member of the British Beekeeping Association and is the umbrella organisation for the 5 local branches in Cumbria. 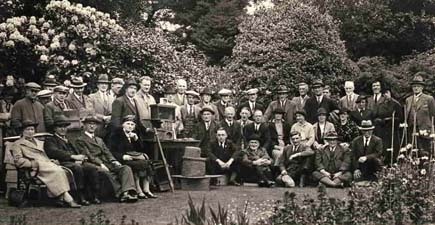 It was formed originally after a meeting of nine beekeepers in Cockermouth in April 1901. Apart from a Mr D S Scott, none of the other founder members are known, except that Lord Muncaster was appointed President, Canon Rawnsley as Chairman and a John Vickers of Boot as Secretary. John Vickers was replaced as secretary (reason unknown) in 1902 by G W Saunders of Douthwaite who remained in office until moving to south of England in 1907. In1903 the membership was 183. The promotion and improvement of beekeeping in Cumbria and the surrounding area. Membership of Cumbria Beekeepers Association is open to anyone subscribing to the aims and constitution of the association, through membership of one its local Branches. The Association has five local branch association. The branches organise meeting and events throughout the year; branch membership provides a contact to share social beekeeping events and training. Beekeepers who join a local Branch of the Association, automatically become members of Cumbria Beekeepers Association, and are then entitled to take part in all its activities and those of any other branches. Members benefit from services provided both by the association that are made available to them through its membership of the British Beekeepers Association. Public liability insurance is provided to individual beekeepers who become full members of the association. The public liability relates to beekeeping activities of full members in the UK.